Prepare yourself for your career with plumbing courses! Plumbing courses are typically run with a learn-by-doing method that allows participants to practice their new skills in real time. Courses cover a wide range of plumbing processes that can be applied to sanitation, electricity, heat, ventilation and water systems. Plumbing is an unavoidable aspect of modern construction. Without quality plumbing work, the quality of life in residential and urban areas would be significantly reduced. Due to its significance in construction and renovation projects, plumbing professionals are highly skilled and sought after. Plumbing as a category of structure refers to the system of pipes, drains, valves and other devices which manage the flow of water and other liquids and wastes within a structure. Plumbing also spans into infrastructure in cities, communities and rural areas. 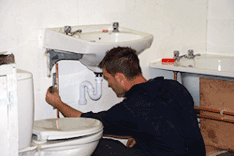 A plumber is a professional who deals with the installation and maintenance of these systems. These people often become plumbers through plumbing courses or apprenticeships. As a largely modern phenomenon and profession, many of the advancements in plumbing systems have occurred within the past few centuries. Plumbing was first introduced in the ancient societies of the Greeks, Romans, Personals, Chinese and Indians. Mostly in the form of bath houses and draining systems for urban areas, these forms of early plumbing dramatically improved the quality of life of then residents. Today, plumbing and piping techniques have evolved to become highly advanced as well as more efficient and safer than ever before. Because plumbing is an evolving area, even established plumbers should keep up with current trends by taking plumbing courses. Practical experience in plumbing can not only result in greater efficiency, but it can also add a boost to a resume or CV. Since plumbing in practice is extremely hands-on, training courses are designed to reflect this reality. Plumbing courses are often set in actual or mock construction sites where delegates are able to perform the tasks which they are learning. Background knowledge on the logic, techniques and technology behind plumbing is delivered alongside practical learning or in a separate classroom phase of a course. Typical plumbing courses will include in-depth explanations, demonstrations and hands-on experience with the materials used, available technology, installation systems, calculation and measurement techniques, environmental awareness factors and safety training. After completing plumbing courses, delegates will be up-to-date on the latest techniques and developments in plumbing best practice. Further, many courses lead to a certification which can be used to gain employment or contracts and prove legitimacy for insurance purposes. Courses are also available in a wide spectrum of levels, from beginner to advanced. Advanced level training for plumbers might include professional insight on how to develop and manage one's own plumbing venture and personal branding in this industry. A safe work environment is a must for professionals working in the field of construction. In order to understand and implement the appropriate safety measures, construction professionals require formal training. In preparation for emergency situations, training and courses in safety prepare professionals to be aware of, avoid and deal with potential dangers on the job. Some plumbing courses will have a health and safety component. As a plumber, it is necessary to be full informed of the potential dangers of working with professional tools and installations. Plumbing courses can be found all over the UK in the form of classroom, online, or in-house to suit the needs of every professional.